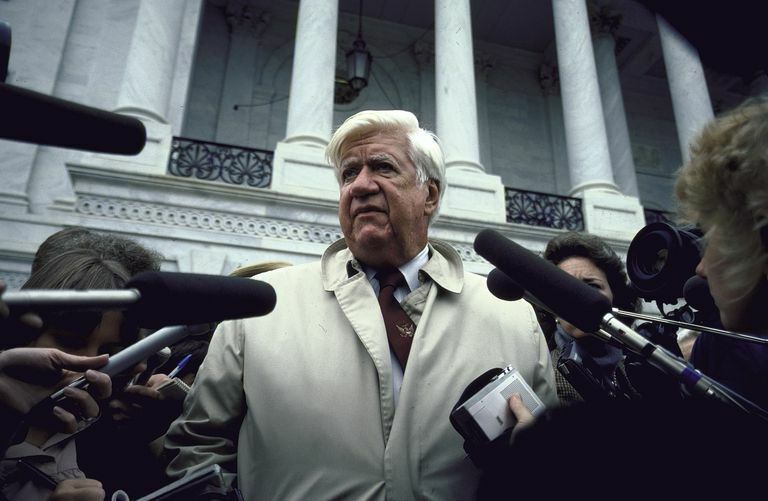 Skilled Legislative Leader Famously Said "All Politics Is Local"
Thomas "Tip" O'Neill was the powerful Democratic Speaker of the House who became the adversary and negotiating partner of Ronald Reagan during the 1980s. O'Neill, a longtime liberal congressman from Massachusetts, had previously organized opposition to Richard Nixon during the height of the Watergate crisis. For a time O'Neill was viewed as one of the most influential people in Washington, as well as one of the most powerful Democrats in America. Revered by some as a liberal icon, he was also attacked as a villain by Republicans who portrayed him as the embodiment of big government. Full Name: Thomas Philip O'Neill Jr.
Key Accomplishments: Member of the U.S. House of Representatives for over 30 years (1953 to 1987). Opposed Reagan's policies forcefully but never bitterly. During Watergate, organized support for impeachment in House of Representatives. Famous Quote: "All politics is local." O'Neill tended to navigate rough political waters with a smile, trying to avoid the bitterness that was beginning to characterize Washington in the 1980s. He urged fellow members of Congress to pay attention to the voters who had sent them to Capitol Hill, and he is remembered for his often quoted comment, "All politics is local." When O'Neill died in 1994, he was widely praised for having been a formidable political adversary who could maintain friendships with those he opposed in tough legislative fights. Thomas "Tip" O'Neill was born December 9, 1912, in Cambridge, Massachusetts. His father was a bricklayer and local politician who served on the city council in Cambridge and later landed a patronage job as the city's sewer commissioner. As a boy, O'Neill picked up the nickname Tip and was known by that for the rest of his life. The nickname was a reference to a professional baseball player of the era. O'Neill was socially popular in his youth, but not a great student. His ambition was to become mayor of Cambridge. After working as a truck driver, he entered Boston College and graduated in 1936. He tried law school for a time but did not like it. As a college senior he ran for local office, and lost the only election he would ever lose. The experience taught him a valuable lesson: he had assumed his neighbors would vote for him, but some of them did not. When he asked why, the answer was blunt: "You never asked us." In later life, O'Neill always told young politicians to never pass up a chance to ask someone for their vote. In 1936 he was elected to the Massachusetts state legislature. He concentrated on political patronage and arranged for many of his constituents to receive state jobs. When the legislature was out of session, he worked in the Cambridge city treasurer's office. After losing his city job due to a local political rivalry, he entered the insurance business, which became his occupation for years. He remained in the Massachusetts legislature, and in 1946 was elected the minority leader in the lower house. He engineered a successful strategy for the Democrats to take control of the chamber in 1948, and became the youngest speaker in the Massachusetts legislature. In 1952, after a difficult primary, O'Neill won the election to the U.S. House of Representatives, taking over the seat John F. Kennedy vacated when he won the election to the U.S. Senate. On Capitol Hill O'Neill became a trusted ally of powerful Massachusetts congressman John McCormick, a future Speaker of the House. McCormick arranged to have O'Neill placed on the House rules committee. The committee posting wasn't glamorous and didn't attract much publicity, but it gave O'Neill a priceless education on the complicated rules of the House of Representatives. O'Neill became a leading expert on the workings of Capitol Hill. Through successive administrations, he learned how the legislative branch deals in a practical way with the White House. During the administration of Lyndon Johnson he was involved in passing critical pieces of legislation for the Great Society programs. He was very much a Democratic insider, but eventually broke from Johnson over the Vietnam War. O'Neill began to view American involvement in Vietnam as a tragic mistake. By late 1967, as Vietnam protests became widespread, O'Neill announced his opposition to the war. He went on to support the anti-war presidential candidacy of Senator Eugene McCarthy in the 1968 Democratic primaries. Along with his stance against the war, O'Neill endorsed various reforms in the House of Representatives and developed an unusual stance as an old-style establishment Democrat who advanced progressive ideas. In 1971 he was selected to be the House Majority Whip, a powerful post in the Democratic leadership. After the House Majority Leader, Hale Boggs, died in a plane crash, O'Neill ascended to that position. In a practical sense, O'Neill was the leader of the Democrats in Congress, as the Speaker of the House, Carl Albert, was seen as weak and indecisive. When the Watergate scandal picked up momentum in 1973, O'Neill, from his powerful perch in Congress, began to prepare for the possibility of impeachment and the looming constitutional crisis. O'Neill knew that if the crisis over Watergate continued to escalate, impeachment proceedings would need to begin in the Judiciary Committee of the House of Representatives. He made sure the committee chairman, Peter Rodino, a Democratic congressman from New Jersey, was up to the task ahead. O'Neill recognized that impeachment would need some support across Congress, and he assessed support for action among members of the House. The moves O'Neill made behind the scenes did not receive much attention in the press at the time. However, writer Jimmy Breslin, who spent time with O'Neill as Watergate unfolded, wrote a best-selling book, "How the Good Guys Finally Won," which documented the skilled legislative guidance O'Neill provided during Nixon's downfall. Having been friendly with Gerald Ford in Congress, O'Neill refused to engage in harsh criticism when Ford, as the new president, pardoned Nixon. When Carl Albert retired as Speaker of the House, O'Neill was elected to the post by his colleagues, taking power in January 1977. That same month, Democrats took the White House for the first time in eight years when Jimmy Carter was inaugurated. Beyond being Democrats, Carter and O'Neill had little in common. Carter had been elected by running against the political establishment which O'Neill seemed to embody. And they were personally very different. Carter could be stern and reserved. O'Neill was known for his talkative nature and love of telling humorous stories. Despite their different natures, O'Neill became an ally of Carter, helping him with legislative matters such as creating the Department of Education. When Carter faced a primary challenge from Senator Edward Kennedy in 1980, O'Neill stayed neutral. The election of Ronald Reagan heralded a new era in politics, and O'Neill found himself adapting to it. His dealings with Reagan, which amounted to persistent principled opposition, would come to define O'Neill's career. O'Neill was skeptical of Reagan as president. In the New York Times obituary of O'Neill, it was noted that O'Neill had considered Reagan the most ignorant man who had ever occupied the White House. He also publicly referred to Reagan as "a cheerleader for selfishness." After a strong showing for Democrats in the 1982 midterm elections, O'Neill wielded considerable power on Capitol Hill. He was able to moderate what he viewed as the extreme impulses of the "Reagan Revolution," and for that he was often ridiculed by Republicans. In numerous Republican campaigns O'Neill was parodied as the classic big-spending liberal. In 1984, O'Neill announced he would run for only one more term in the House of Representatives. He was easily reelected in the November 1984 election, and retired at the end of 1986. O'Neill's opposition to Reagan is often cited by modern pundits as an example of how Washington functioned in the past, with opponents not resorting to excessive bitterness. In retirement, O'Neill found himself a celebrity in demand. During his term as Speaker of the House, O'Neill was popular enough to make a cameo appearance as himself in an episode of the hit television comedy "Cheers." His congenial public image made him a natural for TV commercials for products ranging from Miller Lite Beer to a hotel chain. He even appeared in commercials for the Trump Shuttle, an ill-fated airline operated by future president Donald Trump. Tip O'Neill died on January 5, 1994, in a Boston hospital. He was 81 years old. Tributes poured in from across the political spectrum, from both old friends and old adversaries. Tolchin, Martin. "Thomas P. O'Neill, Jr., A Democratic Power In the House for Decades, Dies at 81." New York Times, 7 January 1994, p. 21. Breslin, Jimmy. How the Good Guys Finally Won Notes from an Impeachment Summer. Ballantine Books, 1976. "Thomas P. O'Neill." Encyclopedia of World Biography, 2nd ed., vol. 11, Gale, 2004, pp. 517-519. Gale Virtual Reference Library.